Polybrominated diphenyl ether (PBDE) flame retardants are endocrine disruptors and suspected neurodevelopmental toxicants. While the direct mechanisms of neurodevelopmental toxicity have not been fully elucidated, it is conceivable that alterations in thyroid hormone levels in the developing brain may contribute to these effects. Cells within the brain locally convert thyroxine (T4) to the biologically active triiodothyronine (T3) through the action of the selenodeiodinase type 2 iodothyronine deiodinase (DIO2). Previous studies have demonstrated that PBDEs can alter hepatic deiodinase activity both in vitro and in vivo; however, the effects of PBDEs on the deiodinase isoforms expressed in the brain are not well understood. 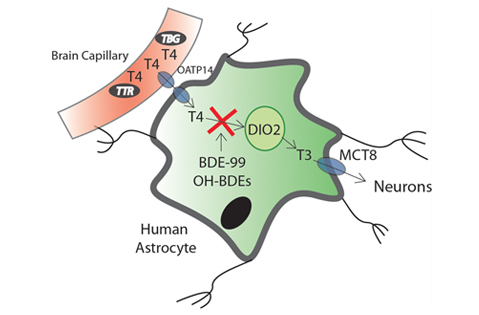 Here, we studied the effects of several individual PBDEs and hydroxylated metabolites (OH-BDEs) on DIO2 activity in astrocytes, a specialized glial cell responsible for production of more than 50% of the T3 required by the brain. Primary human astrocytes and H4 glioma cells were exposed to individual PBDEs or OH-BDEs at concentrations up to 5 μM. BDE-99 decreased DIO2 activity by 50% in primary astrocyte cells and by up to 80% in the H4 cells at doses of ≥500 nM. 3-OH-BDE-47, 6-OH-BDE-47, and 5′-OH-BDE-99 also decreased DIO2 activity in cultured H4 glioma cells by 45−80% at doses of approximately 1−5 μM. Multiple mechanisms appear to contribute to the decreased DIO2 activity, including weakened expression of DIO2 mRNA, competitive inhibition of DIO2, and enhanced post-translational degradation of DIO2. We conclude that decreases in DIO2 activity caused by exposure to PBDEs may play a role in the neurodevelopmental deficits caused by these toxicants. Disruption of type 2 iodothyronine deiodinase activity in cultured human glial cells by polybrominated diphenyl ethers.